The following article is from the January 1931 Elgin Watch Word employee magazine. 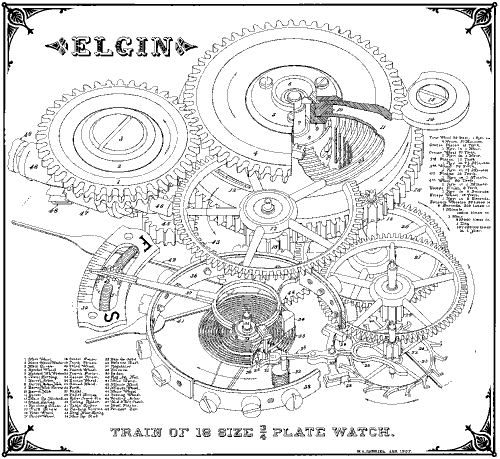 This large scale drawing of the eighteen size three-fourths plate Elgin watch is the work of William A. Gabriel, chief designer of the company, who also designed the watch itself. 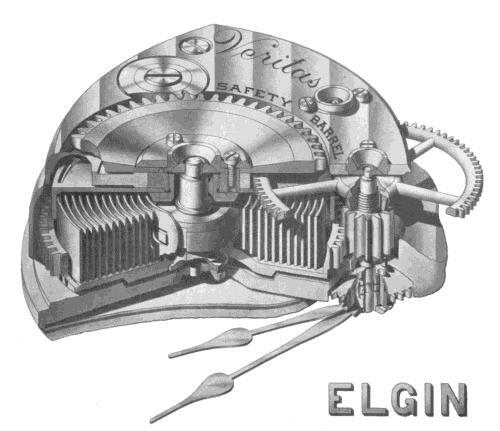 The casual observer of this drawing usually considers that it is a large photograph of an actual watch, but a closer inspection, particularly of the manner in which the parts have been cut away to reveal the inner mechanism, shows the impossibility of accomplishing this by any known photographic method. Realizing the educational value of such a picture if accurately made to scale, Mr. Gabriel undertook the project and carried it to completion entirely during spare moments at his home, requiring more than two years . Mr Gabriel decided to have the final drawing show the watch as it would appear as though turned to an angle of thirty degrees from the observer. The magnitude of the work involved in making this drawing can be better understood from the following brief description of the method by which it was produced. Large scale drawings of forty-nine different details in addition to those of the plates and the damaskeening were first made in pencil to a scale 20-1 from the working drawings of the watch. Next each separate drawing was projected to appear as if seen at an angle of thirty degrees. This involved the transference of thousands of points by the usual methods of descriptive geometry. To obtain exact projection of circles an especially constructed ellipsograph was designed and built. These forty-nine separate drawings were then assembled into one drawing showing the entire mechanism of the watch except the plates. This was done by superimposing the forty-nine separate drawings on their exact centers and in their proper relation and then making a tracing in ink of the entire assembly. After the plates were drawn to the thirty degree angle, the necessary sections were blocked out in order to show the essential parts of the movement. These plate drawings were then transferred to the bristol board on which the final drawing was to be made. This transference was accomplished by means of an especially built pantograph which reduced the scale of the working drawings 2-1 making the finished drawing 10-1. The drawing board containing the bristol board and the board containing the preliminary sketches were mounted side by side on a large table with the pantograph between them. With this method it was possible to lay out the finished drawing without using any working lines and thus the smooth surface of the bristol board was preserved. This was necessary in order to obtain smooth shading in the India ink rendering after the drawing was completed. In order to transfer the parts of the watch to the finished drawing, the large tracing of the entire mechanism was placed on the auxiliary board over the sketches of the plates. Next, such portions of the watch mechanism as were not covered by the plates were transferred by the pantograph to the finished drawing and were inked in lightly as this transference progressed. The 20-1 projected drawing of the ornamenting lines or damaskeening was next placed on the auxiliary board and such portions as would be seen in the final drawing were then transferred by the pantograph to the final drawing in pencil. Pencil was used here in order to retain the desired smooth effect in the final India ink shading. A thin India ink wash was applied with a camel's hair brush, the desired degree of shading being obtained by repeated applications of this wash; for the very deep shading a heavier India ink was was used. First Wheel 78 Teeth 1 Rev. in 6 Hours, 30 Minutes. Center Pinion 12 Teeth 1 Rev. in 1 Hour. Center Wheel 80 Teeth 1 Rev. in 1 Hour. 3rd Pinion 10 Teeth 1 Rev. in 7 1/2 Minutes. 3rd Wheel 75 Teeth 1 Rev. in 7 1/2 Minutes. 4th Pinion 10 Teeth 1 Rev. in 1 Minute. 4th Wheel 80 Teeth 1 Rev. in 1 Minute. Escape Wheel 15 Teeth 1 Rev. in 6 Seconds. 157680000 times in 1 Year. 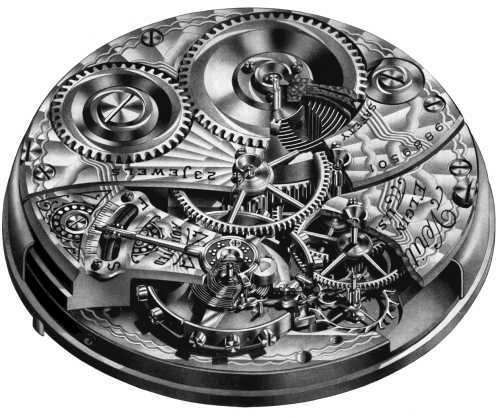 If you want to learn more about how a watch is put together and works, the TimeZone web site has an excellent Illustrated Glossary of Watch Parts. This web site runs on 100% Open Source Software. This web page was last changed on 11/12/2002 at 22:37:00.